(Newser) – Archaeologists in Jerusalem say they've made a first-of-its kind discovery: the seal of an ancient Israelite king—one that may have been made by his own hand. 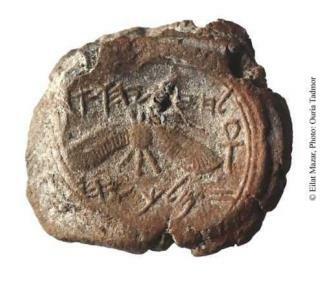 Researchers digging in Old Jerusalem think the seal impression, or bulla, comes from King Hezekiah, who ruled in the 8th century BC, reports the Times of Israel. The find is significant in part because it's the first such seal from an Israelite king found by archaeologists, notes CNN. While similar seals featuring the king's name can be found on the antiquities market, only this one has the authenticity of scientists behind it. It's also notable because Hezekiah himself was "one of the most famous of the Israelite kings" given how he "rooted out idol worship, spruced up the decrepit temple, and centralized power," according to LiveScience. The seal is just half-an-inch wide, suggesting it was made by the king's ring. The "occupation" has been going on THAT long...!? Ahh! More to prove the "history" of the Holy Bible. The rest of the world's spiritual history is in the Holy Bible. Based on his great and historical accomplishments, King Hezekiah was certainly one my favorites of the kings of Judah, during the reign of Hoshea son of Elah king of Israel.